GREENVILLE, S.C., Sept. 18, 2017 — Michelin today challenges designers around the world to leap into the future and then reflect on important shifts in transportation design that will create a new generation of classic vehicles. 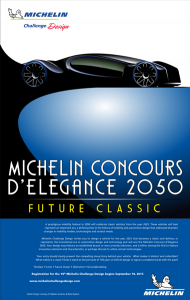 The theme for the 18th Michelin Challenge Design competition, “Michelin Concours d’Elegance 2050 – Future Classic” recognizes a time of great change in the mobility industry. “Autonomous and semi-autonomous vehicles, new markets, powertrains and technologies provide designers with tremendous opportunities for creating imaginative designs that will become new milestones in the historic arc of mobility design,” said Thom Roach, vice president of original equipment marketing for Michelin North America. Designers are encouraged to envision a prestigious mobility festival in the year 2050 that celebrates classic vehicles from the year 2025. These vehicles will best represent an important era, a defining time in the history of mobility and automotive design that addresses dramatic changes in mobility models, technologies and societal needs. Design has become one of the most prestigious global design competitions, thanks in part to its jury members, who are often the advanced design leaders for major automakers. Since its inception, the competition has drawn more than 12,000 entrants from 126 countries. The 18th Michelin Challenge Design theme, “Michelin Concours d’Elegance 2050 – Future Classic”, invites entrants to design a timeless, iconic vehicle from an established brand, or one currently unknown, for the year 2025 that will become a classic and defines, or represents, this transitional era in automotive design and technology and will win the Michelin Concours d’Elegance 2050. Entries open on September 18, 2017 at www.michelinchallengedesign.com. Winners will be recognized at the 2018 Movin’On by Michelin sustainable mobility global event in Montreal. Dedicated to the improvement of sustainable mobility, Michelin designs, manufactures and sells tires for every type of vehicle, including airplanes, automobiles, bicycles, earthmovers, farm equipment, heavy-duty trucks and motorcycles. The company has earned a long-standing reputation for building innovative premium tires. In addition to tires, the company also publishes travel guides, hotel and restaurant guides, maps and road atlases. Headquartered in Greenville, S.C., Michelin North America (www.michelinman.com) employs about 22,850 and operates 20 major manufacturing plants.